Electricity redistribution: Which councils are likely to feel the pinch? In April 2015 the acting CEO of Eskom suggested that in order to improve Eskom’s financial situation, that the utility bypass municipalities and supply all customers directly with electricity. How would municipalities be affected if this proposal is adopted? Acting as middle-men, municipalities buy electricity from Eskom in bulk and then re-sell the power to residential, business and industrial customers. The process generates a financial surplus that municipalities use to fund other activities1. 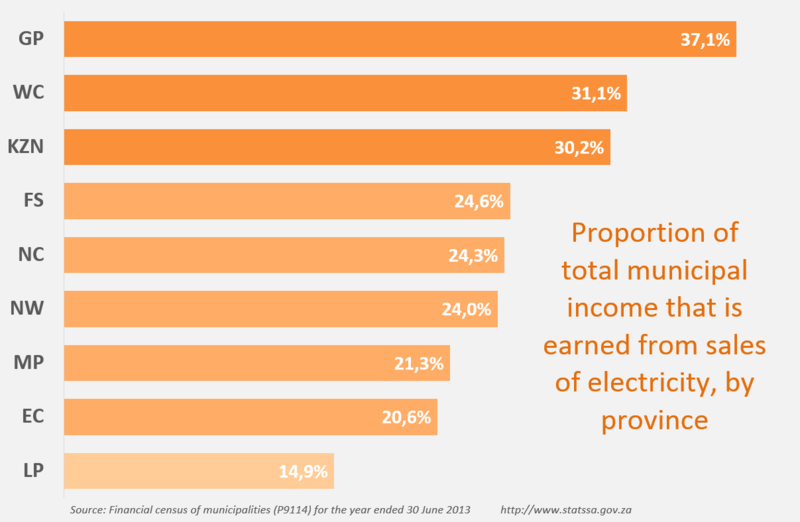 Approximately 30% of total municipal income was earned from sales of electricity during the 2012/13 financial year, according to Stats SA’s latest Financial census of municipalities report2. That is R77,2 billion out of a total income of R258,0 billion. The financial viability of many municipalities could be tenuous if they were no longer able to trade economic services, such as electricity. 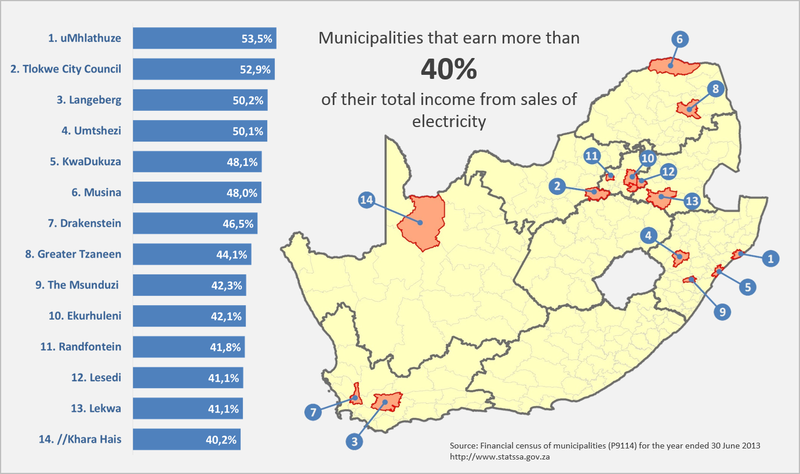 Broken down by province, it is interesting to note that municipalities in predominantly urban provinces are more dependent on this form of income, with 37,1% of income in Gauteng earned from electricity sales, followed by Western Cape at 31,1%. The map below shows the same data, but includes all local and metropolitan municipalities. Notice the high percentages for municipalities in Gauteng and Western Cape? There are some municipalities in predominantly rural provinces that do not sell electricity and as a consequence do not earn income from this source. 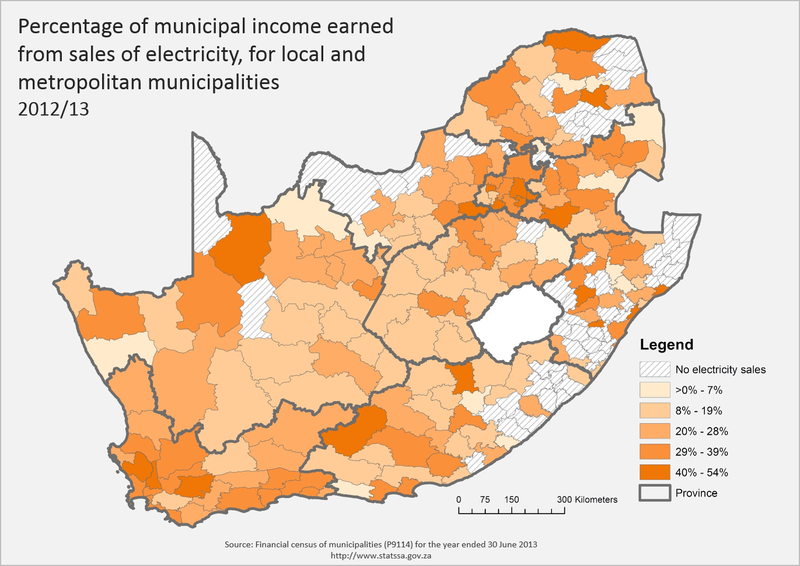 Customers living within these municipalities obtain their electricity directly from Eskom. 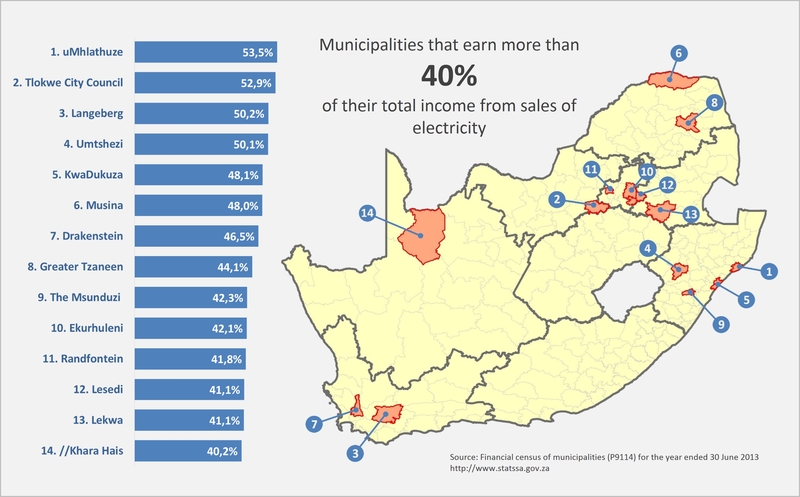 The map above can be refined further, highlighting those municipalities that earned more than 40% of their income from electricity sales in 2012/13. The number one spot is held by uMhlathuze (Empangeni and Richards Bay) with 53,5%. Tlokwe City Council, the Potchefstroom area, comes second (52,9%), followed by Langeberg (50,2%). One metropolitan council appears in the list: Ekurhuleni (42,1%), placed at number 10. Note that the maps above show data for one financial year (namely 2012/13). A more detailed analysis of data spanning a number of years would provide a more comprehensive picture. An updated Financial census of municipalities report will be released on 15 June 2015, with figures for the 2013/14 financial year, revised figures for 2012/13, and detailed time series for various financial indicators, including electricity sales. 1The surpluses earned from trading services offsets losses incurred in providing non-economic services such as health, sport and recreation, planning and other community services. 2Visit the download page for the 2012/13 Financial census of municipalities here.